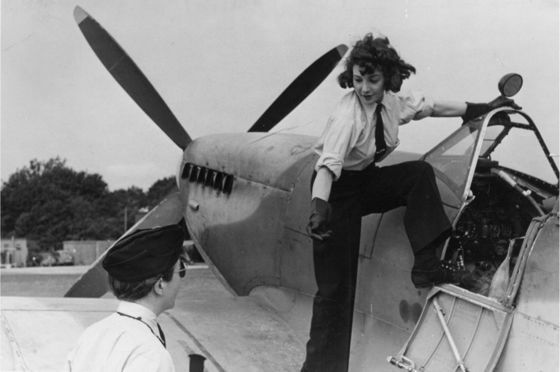 Awhile back I read an article on Constance Leathart, a woman who was one of the first in WW2 to fly spitfires. As part of my Modern Go-Getter Monday, I wanted to share her story. I'm trying to keep with my goal of sharing people who inspire me every Monday, and I'm ashamed that it has taken me this long to share Constance Leathart. She has a special spot in my heart, simply because I have a desire to learn to fly a plane. I'm not necessarily talking about jets or big ones, but personal, smaller planes. I guess in the end it doesn't really matter--I just want to learn. I think it would be so rewarding, and a heck of a skill to have. One of the things that gets me is how this was almost a hundred years ago, Constance getting her first lesson. Times flies. No pun intended. But really, life moves at such a fast pace. It's eager to get on with things. And we always have to run fast enough to keep up. Go after our aspirations. No matter what stands in our way.